Artist Ulises Farinas has a new mural and it is just as awesome as his previous one. Here at The Daily Zombies, we have featured the works of artist Ulises Alfonso Farinas frequently for his uncanny sense of aesthetics in ensembled pieces. Following his awe-inspiring massive mural depicting an all-out battle pitting the DC Universe against the Marvel Universe, the artist has created another cool mural piece for Wired. 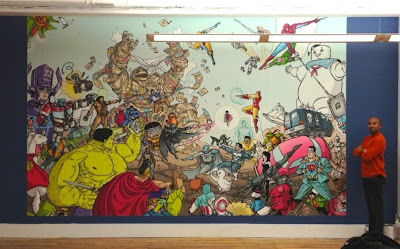 And now, the comiXology office is now the new home to the massive mural. Hit the jump to check out the photos. 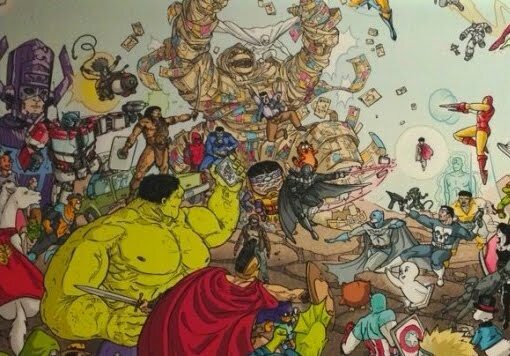 Comixology recently got in touch with me, to make a giant mural of my Wired Superhero Battle drawing. This is how it turned out, it looks amazing! I can’t wait to see it in person.